Bad Manners are an English 2 Tone ska band. They quickly became the novelty favourites of the UK pop scene through their bald outsized frontman’s on-stage antics, earning early exposure through their Top of The Pops exploits and an appearance in the live film documentary, Dance Craze. They were at their most popular during the early 1980s, during a period when other ska revival bands such as Madness, The Specials and The Selecter filled the charts. 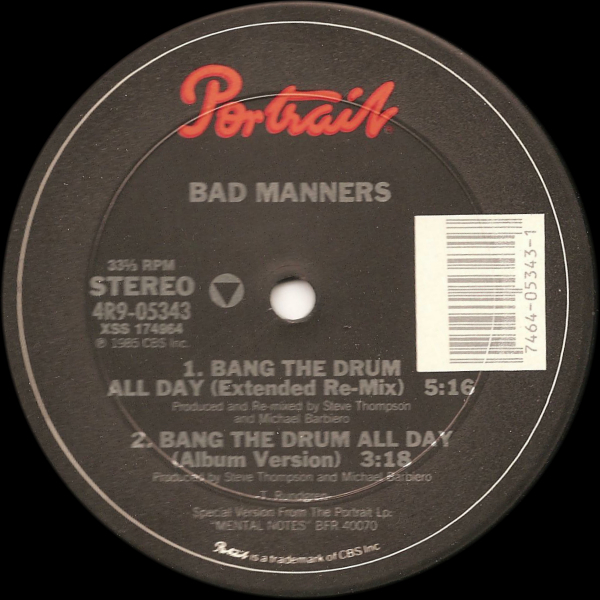 Bad Manners spent 111 weeks in the UK Singles Chart between 1980 and 1983,and they also achieved chart success with their first four studio albums with Gosh It’s… Bad Manners, Loonee Tunes! and Ska ‘n’ B being their biggest hits. “Mental Notes’ would be released on CD for the first time in 1999 containing the 12” remixes of Blue Summer and What The Papers Say. “Bang The Drum All Day” was remixed by Steve Thompson & Michael Barbiero for the US Portrait 12″ single release.